Igglepiggle leaves his blanket while he dances, but then he can't find it. Then he sees his blanket running about by itself. In a magical forest, colourful characters have adventures. Igglepiggle lets out a very big sneeze and soon Upsy Daisy and the Tombliboos are sneezing too. In a magical forest, colourful characters have adventures. Upsy Daisy, Makka Pakka, the Tombliboos and Igglepiggle go for a ride on the Pinky Ponk. In a magical forest, colourful characters have adventures. The Tombliboos ride the Ninky Nonk and it stops in a lovely part of the garden. Animation. The Pontipines play hide-and-seek with the Wottingers. Then the Pontipines and the Wottingers ride in the Ninky Nonk all the way home. In a magical forest, colourful characters have adventures. Daisy and Igglepiggle find the ball in the garden, and soon everyone is kicking it to each other. Series for young children. Makka Pakka has a pile of six stones. He gives one stone out to everybody he meets around the garden until he has none left. Children's programme. The ball is bouncing through the garden and lands straight on Upsy Daisy's bed. She tucks the ball in so it can have a rest. Children's programme. The Pontipines and the Wottingers are out for a walk in the garden when Mrs Pontipine spots the Ninky Nonk through her binoculars. Children's programme. Upsy Daisy has a dancy day. First she dances with the Tombliboos, then she dances with the Pontipines. The Pontipines decide to have their dinner on the Ninky Nonk, but it is a bouncy ride as they travel upside down along the branches and around the garden. 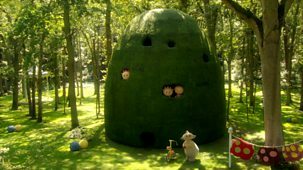 Series 1 - Where Did Makka Pakka's Sponge Go? Children's programme. 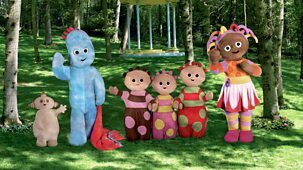 Makka Pakka trips over a stone and his sponge flies off into Upsy Daisy's megaphone. 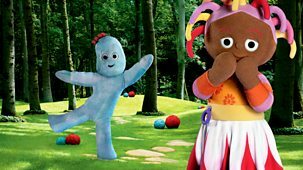 The garden is very noisy when Igglepiggle goes out for a walk. Soon he goes too far and gets lost, so the Pontipines use the trubliphone to help. In a magical forest, colourful characters have adventures and are read stories. 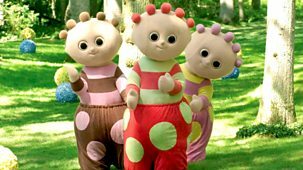 Tombliboo Eee becomes separated from the other two Tombliboos, Unn and Ooo. Children's programme. 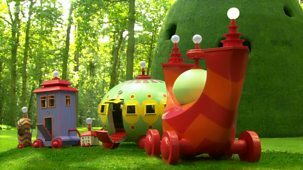 The Tombliboos and Makka Pakka take a ride on the Ninky Nonk. Series 1 - Look What The Ball Did! The ball bounces all over the garden. It accidentally knocks over Makka Pakka's pile of stones, so Makka Pakka rebuilds it and tries to protect it. In a magical forest, colourful characters have adventures and are read stories. Everything in the garden is so noisy that Igglepiggle finds a quiet place. The Tombliboos are playing, but Tombliboo Eee cannot decide what to do as she doesn't want to play the drums like Tombliboo Unn or play with bricks like Tombliboo Ooo.